Start Your ADA Subscription Today! 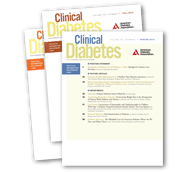 The Journals of the American Diabetes Association are the most read and cited publications in the field of diabetes research and patient care. With more than 75 years of publishing experience, ADA is the authoritative source for the latest in diabetes information. We offer your choice of annual subscriptions, or you can purchase individual issues of the publication of your choice. Simply click on the subscribe links below. If you are a current member, click here for member-only savings on journals. 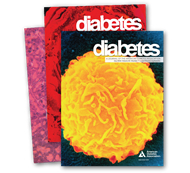 Diabetes® is the highest-ranked journal devoted exclusively to basic diabetes research. This monthly, peer-reviewed journal publishes original research articles on the physiology and pathophysiology of diabetes and its complications. Diabetes is the premier research journal devoted to the physiological mechanisms underlying diabetes and its complications. Diabetes Care® is the highest-ranked research journal devoted exclusively to diabetes treatment, care and prevention. 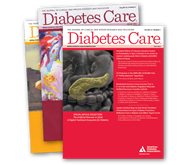 Diabetes Care publishes original, peer-reviewed research on topics of interest to clinically-oriented physicians, researchers, epidemiologists, psychologists, diabetes educators, and other health professionals. Clinical Diabetes® provides primary care providers and all clinicians involved in the care of people with diabetes with information on advances in state-of-the-art care. Clinical Diabetes translates research into treatment practices for a clinical setting and also serves as a forum for discussing diabetes-related problems in practice, medical-legal issues, case studies, digests of recent research, and patient education materials. 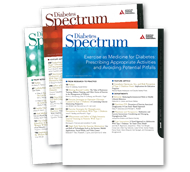 Diabetes Spectrum® provides diabetes educators and health care professionals with the most timely and essential information to enhance diabetes self-management education and to optimize patient outcomes.